Chop even-sized blocks of gammon, red pepper and leftover Christmas roast potatoes. Fry over high heat in a generous dash of olive oil until the peppers are cooked and soft and the potatoes and gammon are nicely caramelised. (The peppers may take a bit longer as they are the only uncooked ingredient, so give them a 5-minute head start before you add the gammon and potatoes.) 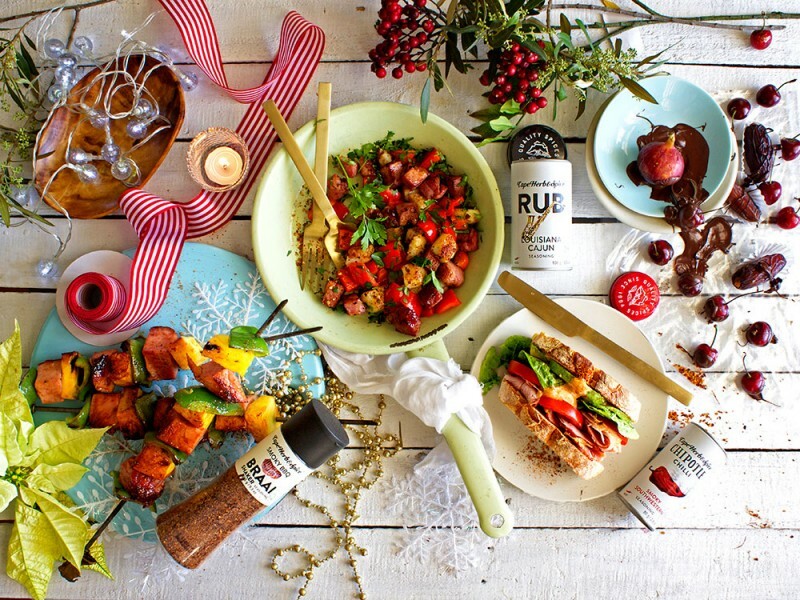 Towards the end of cooking, give it a generous dusting of our Cape Herb & Spice Louisiana Cajun Rub Seasoning. Serve warm with loads of chopped flatleaf parsley or torn basil. Thread even-sized chunks of gammon, pineapple and green pepper onto skewers. Brush with a basting sauce made of tomato sauce, a drizzle of honey, a squeeze of lemon and a generous dusting of our Cape Herb & Spice Smokey BBQ Shaker Seasoning – taste as you stir, and adjust as you like, to create your own personalized basting. Place the sosaties on the braai/ barbeque and brush with marinade. Gammon takes the place of bacon in this take on the classic BLT. Slice gammon very thinly and layer onto toasted ciabatta along with sliced tomato, lettuce and avo. Drizzle over a smoky mayonnaise made by simply stirring together your favourite mayonnaise, a tablespoon or two of lemon juice and a generous shake or our Cape Herb & Spice Chipotle Chilli Seasoning. If you have cherries left over from your Chinese 5-spice Gammon, and figs and dates from your Moroccan Quinoa Salad, why not turn them into a dessert? Few things beat luscious cold fruit in a hard chocolate coating. To make it, melt chocolate, add a teeny dusting of your favourite Cape Herb & Spice Chilli Seasoning and dip the fruit in the chocolate. Place on a sheet tray lined with wax paper and set aside to harden. Chocolate does harden at room temperature, but if it’s a very hot day, give it some help by placing it in the fridge.